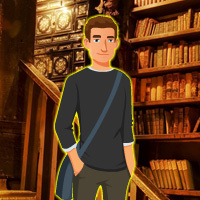 Wow Escape the Student from Library is another point & click escape game developed by WowEscape. In this game, a student is trapped in a library. No one is near to help him. You have to find the way to rescue the student by finding useful objects, hints and by solving puzzles. Click on the objects to interact with and solve puzzles. Good luck and have fun! Where is the clue for the 4x4 puzzle in 2nd set room with the yellow no-smoking symbol? Thought it was a sudoku...maybe it is, but the solution I tried didn't work. Also need 3rd ruler for 1st set room with blue 9. NVM about the ruler, found it in plain sight in 1st set. Hopefully that will get me going to find the other clue. Clue for 4x4 grid in leather case in 2nd set. Out without finding and placing 3rd pink rectangle.